For any other information please contact us at (920) 619-2803. How do I get enrolled? How many hours is the course? BRC1 – The class is a total of 15 hours. Classroom consists of 5 hours and the riding portion consists of 10 hours. BRC2 – Three hours of classroom, plus 6 hours of range exercises (driving). A one-day course (either Saturday or Sunday only) for a total of 9 hours. What does the course consist of? In the classroom learners will be provided with ways to minimize risk and handle special riding situations. During the riding portion learners will be coached to develop the physical skills of basic control including straight line riding, stopping, turning and shifting and then move on to more advanced skills in stopping quickly, cornering and swerving. Do I need my temporary permit before the course begins? BRC1 – A motorcycle temporary permit from the Department of Transportation is not required to enroll in or participate in the BRC1. 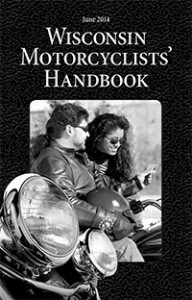 Effective October 1, 2006, individuals completing a BRC1 are not required to hold a motorcycle temporary permit before they receive their class M (motorcycle) endorsement. In other words, if a student decides to take the motorcycle course and passes, he/she may present the yellow copy of the Motorcycle Skills Test Waiver Authorization Form (MV3575 received upon class completion) at the Department of Transportation, then take the written knowledge test. NOTE: Students who want to practice riding their motorcycle on the roadways prior to attending the motorcycle course will need to pass the written knowledge test at the Department of Transportation and pay the temporary permit fee. Individuals under 18 years of age who want a temporary permit for the third time will need verification of enrollment to present to the Department of Transportation to obtain their temporary permit. The MV3575 Motorcycle Skills Test Waiver Authorization Form is the required document and is available, after enrollment and payment, by calling (920) 619-2803. 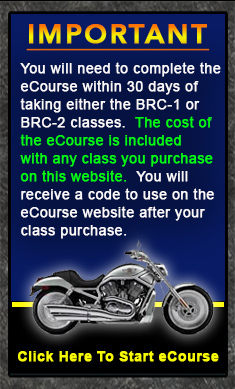 BRC2 – A motorcycle temporary permit is required to enroll in and/or participate in the BRC2. Also, participants must be 18 years or older to enroll in and/or attend the BRC2. Again, individuals who want a temporary permit for the third time will need verification of enrollment to present to the Department of Transportation to obtain their temporary permit. The MV3575 Motorcycle Skills Test Waiver Authorization Form is the required document and is available, after enrollment and payment, by calling (920) 619-2803. Do I need to bring my own motorcycle? BRC1 – Students may bring their own licensed motorcycle along with proof of registration and insurance. BRC2 – Students bring their own licensed motorcycle along with temporary motorcycle license, proof of registration and proof of insurance. The learner is required to wear the appropriate riding gear for riding sessions, including long pants, long sleeve (shirt or jacket), sturdy shoes that cover ankles, full-fingered gloves, eye protection and a DOT-approved helmet. Although we do provide helmets, there is a limited number of helmets (sizes: medium through 5X) available for student use. What size motorcycles will we learn on? BRC1 – According to State of Wisconsin guidelines, motorcycles used in the BRC1 are 350cc or smaller. KD Motorcycle Training, LLC has a variety of makes and models available for student use designed to accommodate individual size specifications. These makes and models include: Suzuki GZ250, Suzuki Van Van 200, Honda Rebels (250cc), Yamaha V-Star (250cc), and Yamaha Tw200. How old does a person need to be to take the course? BRC1 – Learners must be 15 ½ years of age and have completed Driver Education Theory. BRC2 – Participants must be 18 years or older. What are the requirements for successful completion? Will I get my license if I pass the course? Upon satisfactory completion of the course, the learner will be provided with a MV3575 Motorcycle Test Skills Waiver Authorization and will not have to take the skills/road test at the Department of Transportation. The Waiver Form, when presented at any Wisconsin Department of Transportation exam station, will entitle the individual to a Class “M” Endorsement provided other licensing requirements are met.